Is Harvard Now Behaving Like Any Other College Basketball Juggernaut? Fast forward to present. Harvard is in the NCAA Tournament, led by several of those original recruits. And a different story just appeared in the Harvard Crimson. It's about four-star prospect Zena Edosomwan, a 6-foot 9-inch, 225-pound power forward that Scout.com ranks as the 15th best player at his position in the country. Both Scout.com and ESPN have Edosomwan in their top 100 players overall. Over the weekend, he shunned scholarship offers from UCLA, USC, UC Berkeley, Texas, and Washington to commit to Harvard. "It's a special day for all of us-for me [and] for Harvard basketball," Edosomwan said. It's a special day whenever a smallish school for nerdlings beats the towering jocks, even if it's only in a recruiting race. Five years ago, you'd consider Harvard's inclusion on the above list an error. Not anymore. If nothing else, Edosomwan signals that what Amaker started won't end when Harvard gets knocked out of the tournament. (Amaker has already landed one three-star forward along with ESPN's No. 19 center in the country for next season.) It might even herald a new era for Ivy League basketball, at least if other schools begin recruiting the same way and especially if those academic standards previously mentioned continue to slide, perhaps into the same trough where you find Mike Krzyzewski rooting around. For now, it doesn't seem like the slippage has been quite that dramatic. (Harvard, for its part, denies any erosion of standards.) Edosomwan still hasn't qualified academically for Harvard, which like other Ivy League schools doesn't award athletic scholarships. It's kind of funny to see ESPN's "recruiting nation" mention Harvard's "offer" to Edosomwan. What offer? An opportunity to apply if he scores over 700 on his SAT math section? "We're seeing a significant change in the caliber of the student-athlete," said Steve Bilsky, the University of Pennsylvania's athletic director, one of more than 50 Ivy League administrators and coaches interviewed. "It's not even the same population because the pool has widened. We see a considerable number of student-athletes turning down athletic scholarships from places like Stanford, Northwestern or Duke to come to Penn." But back to Edosomwan. Whatever scores Harvard requires of him, he doesn't have them yet, according to the Crimson. Edosomwan has taken standardized tests "multiple times" and is now waiting for the results of his latest attempt in January. In trying to qualify for Harvard, he's reclassified himself as a 2013 prospect and is doing a post-grad year at a prep school in Massachusetts called Northfield Mount Hermon. This is something like the one-percenter version of what happens at many big basketball schools when a talented athlete doesn't have the academic chops to get in. It's just happening on a higher academic level, and while Edosomwan can't enjoy having his intellectual bonafides laundered so publicly, you've got to to think that if he's close to meeting Harvard's dangerously diminished standards, he's plenty booksmart for dozens of other programs. [N]ot quite so bad a school as to stand alongside the pure basketball-postgraduate factories (Brewster, Tilton, Winchendon, etc.) of the world, but it's close. Northfield Mount Hermon currently has 25 graduates playing Division I basketball, according to the Crimson. Three of them play for Harvard. A fourth will be arriving next year. If Edosomwan qualifies, that'll make five. 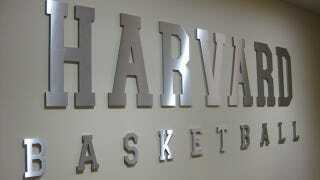 Which makes Northfield Mount Hermon the official pipeline to Harvard for highly recruited basketball players. And there you have it: transformation complete. In a quick four years, Harvard has gone from hoops nonentity to a program with a top 25 AP ranking, a twelfth seed in the east region, and at least some of the less-than-puritanical hallmarks of the high-major heavies. If you're interested in learning more about Harvard's evolution, the Crimson has a long and well-reported story on the subject. Harvard's efforts in basketball underscore the increasingly important role that success in high-profile sports plays at even the most elite universities. In the race to become competitive in basketball, Harvard's new approach could tarnish the university's sterling reputation. Could it? Harvard has gobs of money, a puissant name and exactly 19 students on the men's basketball team. That's barely enough to tarnish the paint job in the Lavietes Pavilion locker room, let alone the school's overall academic standards. And it's not like Harvard hasn't engaged in behavior that does far more to tarnish the school's reputation. Perhaps we should reconvene for debate after the Crimson put in back-to-back Final Four appearances.